We Get Festive | Sprezzatura, Y'all! Recently we got a memo from the city. One was placed in every mailbox so we dutifully got ours and with the help of Google Translate, figured out the gist of it. They want us to put white candles on our window ledges during the Christmas season. I love this. I can imagine how beautiful it will look with hundreds of glowing candles set in the windows. We’ve got our candles ready and have given them a test burn. Can’t wait to see if everyone does it and how magical it will look. This is hard to photograph because the streets are so narrow and it’s kind of dark, but here are a couple of the candles we put out. The town is getting ready for Christmas. There are trees up everywhere and they’re busy decorating them. We’re not sure of the timing of any of this, but we think there are lots of events planned. We’ll just go with the flow. There’s also some kind of nativity processional, madonna and all. We need to find out for sure because Steve has been asked to play Joseph. We’re not sure if this is an honor or a joke. The rest of the townspeople may be laughing about the unwitting American they suckered into playing Joseph. Knowing these people as I do, I doubt this is the case. But because we really can’t speak the language beyond exchanging pleasantries and asking for directions, we’re not sure. So we’ll see what happens. Our neighbor, Jonpietro, is the one who arranged for Steve to be Joseph. Jonpietro lives a few doors down from us and is one of the ones who have taken us under his wing. He speaks ABSOLUTELY no English, so we get by on our pitiful Italian and lots of pointing and gestures. He’s really taken a liking to Steve and according to our landlord and friend, Giovanni, is an important person in the community. Important enough to have an American play Joseph in the Christmas processional. 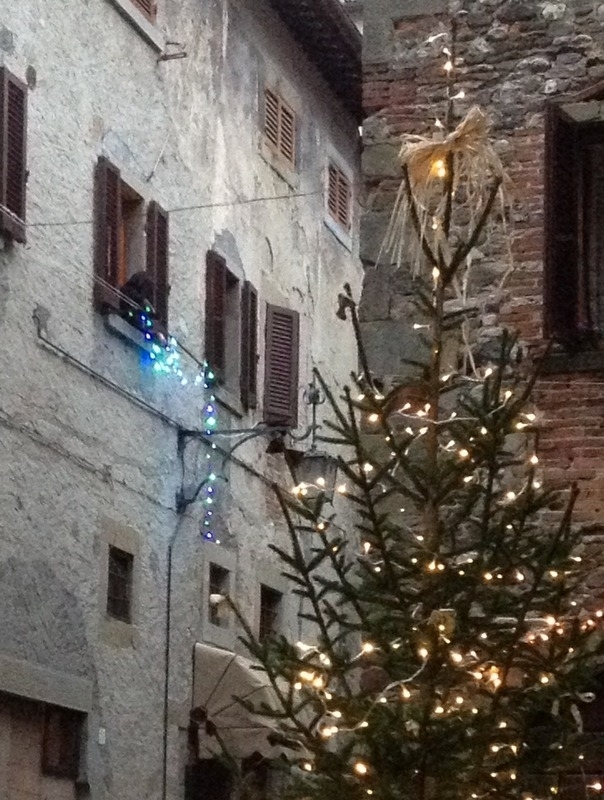 Italy celebrates the Christmas season on a slightly different schedule than America. It really starts on December 8, the Feast of the Immaculate Conception, and goes until January 6, the Feast of the Epiphany. Notice the word “feast” before these events. Those elusive 12 days of Christmas that most Americans scratch their heads over – they run from Christmas day until January 6, the Epiphany. It’s not like in the U.S. where Christmas creeps in earlier and earlier every year. Used to be the official start of Christmas was the day after Thanksgiving. Now you see decorations up around Halloween. Here, it’s much slower to start but it lasts longer. Every day there are new lights and decorations. We try to take a little stroll every evening to see what it all looks like. Tonight we walked down a very out of the way street, really tucked away and not a street we ever use. A woman there had a whole miniature nativity village set up outside her house. Complete with lights. To think that she leaves that out for weeks and it’s OK is amazing to me. We’ll definitely put this street on our regular evening tour to see if she adds to it. The main piazza has a little North Pole vignette, complete with Christmas carols (all in English – one of America’s great contributions to the world, apparently) and a letter box for kids to drop their Santa letters in – how cute is that? Dear Babbo Natale – Dear Father Christmas. Babbo is the Tuscan word for father – kind of like Daddy. There’s also a bookstore around the corner from us and they have Santa and his elves out passing out candy and hearing the children’s wishes for Christmas morning. They’re also playing good old American Christmas music. 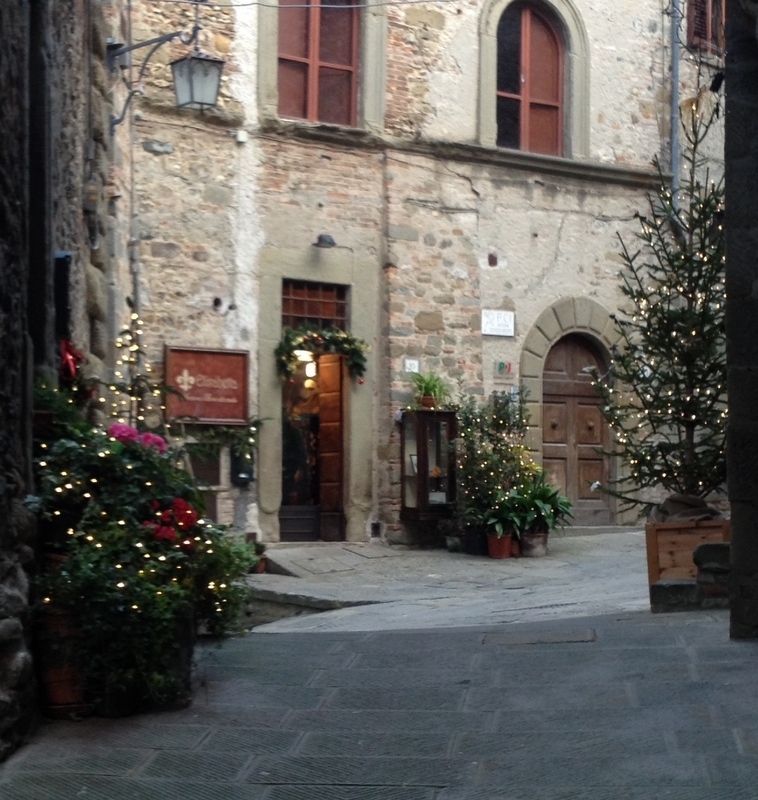 I’ve said this before about Anghiari, but it’s a cross between New York City and Mayberry. So much going on all the time and so much to do – restaurants, shops, museums, theater, art – but very small and compact. Everyone knows each other and you can walk the entire town in 15 minutes (including the hills). 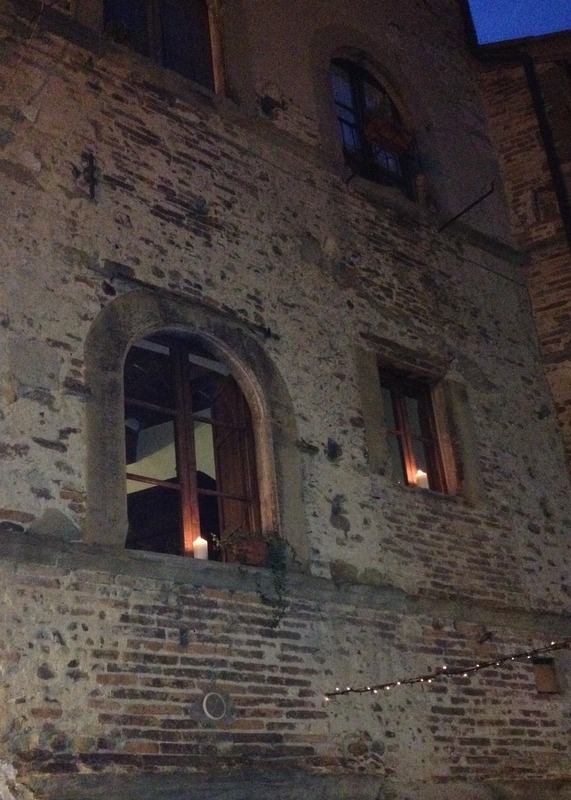 Living in the centro storico (historic center) is ideal because we’re right in the thick of things. We never miss anything and are just steps away from all the action. Today starts the Christmas season and I think it will be a good one. Complete with Bing Crosby. Love these pictures and all The festivities. Perhaps you could record a dress rehearsal of Joseph. I am sure it will be absolutely beautiful with all the candles in the window sills. How fun to have such a small town that everyone gets the same memo and acts on it! I don’t think there’s a dress rehearsal! If only. Can you imagine a town asking anyone in America to set a lighted candle anywhere? Would never happen. These buildings are all thick stone and brick – very little wood, so I guess it’s unlikely they’ll go up in flames. If they haven’t for 800 years, then why now?